Every day more than 10,000 people turn 65 years old, according to the U.S. Department of Health and Human Services. In Genesee County, nearly 59,000 residents (14 percent of the total population) are within that age bracket. Expect this demographic shift to continue, says the U.S. Census Bureau, which projects that the nation’s 65-and-older population will reach 83.7 million (or 21 percent of the total) by 2050. As this trend of greater longevity continues, knowing the options that exist for senior healthcare is essential to aging well in Genesee County. 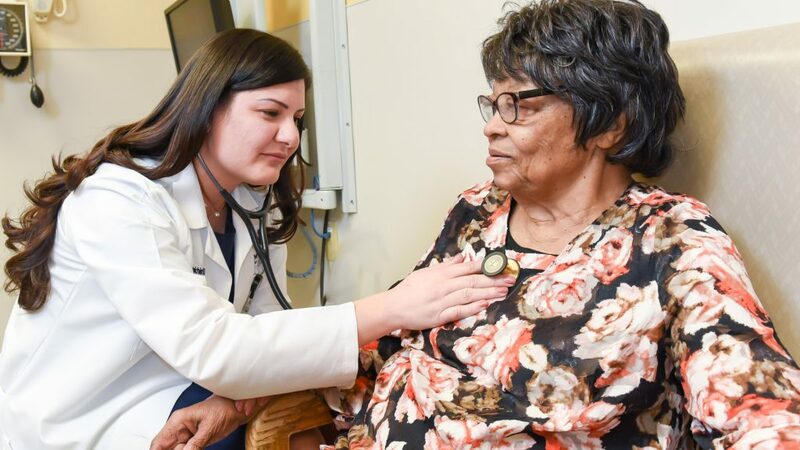 Hurley’s Senior Center of Excellence is one such resource among healthcare providers, providing specialized geriatric care to handle all the health care needs of aging residents. The services offered at Hurley include a fast-track emergency room for patients 65 years and up, a geriatric fracture center and a pharmacist with specific training in geriatric medicines, among many other programs that illustrate its commitment to senior care. All medical and surgical nurses at Hurley have NICHE (Nurses Improving Care for Healthsystem Elders) training, which secured the medical center a prestigious nursing distinction that only five other hospitals in the state have. Stacie Abraham, a geriatric nurse specialist at Hurley, says that geriatric patients have many different needs, not to mention different kidney, liver and heart function. Seeking the type of specialty care that Hurley offers can not only lead to better outcomes for them, it can give their families peace of mind. As a registered nurse with an extra certification in geriatrics on top of her NICHE training, Abraham sees daily how Hurley’s unique senior services can change the tone of a patient’s hospitalization. Hurley has measures in place to prevent issues like delirium and depression before they even start, while enabling staff to take care of immediate needs with tailored strategies. Patients with advanced dementia or with speech impairment from a stroke use picture boards to communicate. To overcome hearing barriers, there are amplifiers, devices that allow seniors to use earbuds to hear amplified sounds. Another trick of the trade: talking to patients with hearing difficulties via stethoscopes. It is vital to have a team that understands the specific needs of geriatric patients. Understanding the specific needs of geriatric patients is vital. The last thing anyone wants is for patients who are already prone to being disoriented and frightened to become more agitated. That is why geriatric nurse specialists like Abraham work closely with bedside nurses at Hurley to ensure the entire care team is on board with all of the added layers of care available to seniors. They screen patients for their risk of falls and delirium and go over medications with a fine-toothed comb, often finding errors in dosages that have been carried over from nursing homes. “We recommend that the same caregiver cares for the patient, which alleviates a lot of fears and builds trust,” Abraham added. To help with this, Hurley recently launched its grant-funded Hospital Elder Life Program (HELP). The program trains a group of volunteers to assist senior patients with mobility and basic needs. The volunteers play games, read, help with general socialization and mobility exercises—all to keep senior patients grounded in their surroundings and as active as their condition allows. They also provide companionship at mealtimes as well as assistance with feeding, and are even trained to give a light massage to regulate a patient’s sleep, which has dramatically cut down on the use of inappropriate sleep medications. 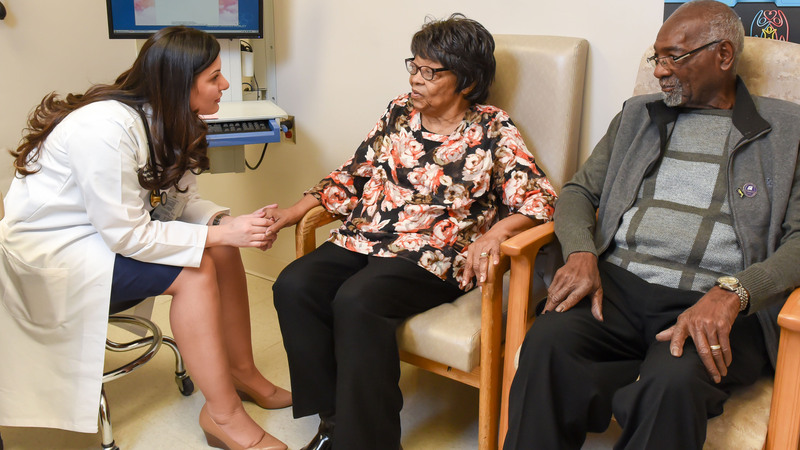 Without these interventions seniors tend to stay in the hospital longer, which negatively affects their outcomes, said Rasha Nakhleh, MD, geriatrician. “Younger patients are often in and out with no complications,” said Dr. Nakhleh. In contrast, seniors may face multiple risks when they are hospitalized, including infections, which tend to be more serious in seniors; a decline in function; delirium; and side effects from medications. “At Hurley, they have staff—nurses, medical assistants and physicians—that can prevent these unfortunate things from happening,” Dr. Nakhleh said, adding that caregivers follow seniors from admission to discharge to address age-specific care concerns. The specialized measures Hurley offers have led to decreased fall rates, less occurrences of delirium, fewer medication errors and fewer stops in nursing homes after discharge. When the goal is facilitating a return home with the ability to function in their communities as before intact, these improvements are huge—and not just for the patients. “It’s not only about the patient themselves but about their supporting systems. Educating their family/loved one on how to handle certain circumstances is important,” said Dr. Nakhleh, whose patient roster includes multiple generations within the same family. She has noticed the interest in senior services gaining traction via word of mouth from friends, neighbors and church family. “There are a lot of patients who say they think they’re at the right age, as opposed to five or 10 years ago, when it was not that common to seek out that special care,” Dr. Nakhleh said. The level of expertise offered at Hurley’s Senior Center of Excellence helps senior patients maintain their function and their health, which makes them better able to enjoy Flint’s resurgence. By elevating care for this important patient population, Hurley is making sure residents in our community and their loved ones aren’t simply aging but aging well.